While many leaders in Kashmir would argue about their successful political stunts, the reality still remains that there seems to be a hesitancy to make a political progress because geo-strategical politics in the region have not been stable for a while. Pakistan is in a transition right now. They are banking on representative democracy and army co-ordination to emancipate as a stable country. While Kashmir has always been an underlying issue, the preferential cause for the national state actors in Pakistan right now is a stable political state. India right now, being the world's largest democracy is in a dilemma. The country has faced corruption scandals in the previous government tenures. The masses want to decide between Hindu vote and Secular vote. These things should concern the political class in Kashmir, whether in India or Pakistan. For how long Kashmiri people should wait for a conductive political climate to happen? Infact, why aren't leaders letting it happen? This waiting game should not be taken as a political advantage, but as a reminder of immoral bankruptcies. 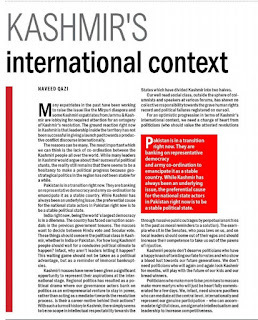 Kashmiri masses have never been given a significant opportunity to represent their aspirations at the international stage. Regional politics has resulted as a political drama where our governance actors bank on politics as an entrepreneurial venture to stay in power, rather than acting as a mediator towards the resolution process. Is their a career motive behind their actions? With such a turmoil history in Kashmir, there simply seems to be no scope in intellectual respectability towards the States which divided Kashmir into two halves. Our well read social class, outside the spheres of columnists and speakers at various forums, have shown no collective responsibility towards the grave human rights record and political failures registered on our soil. 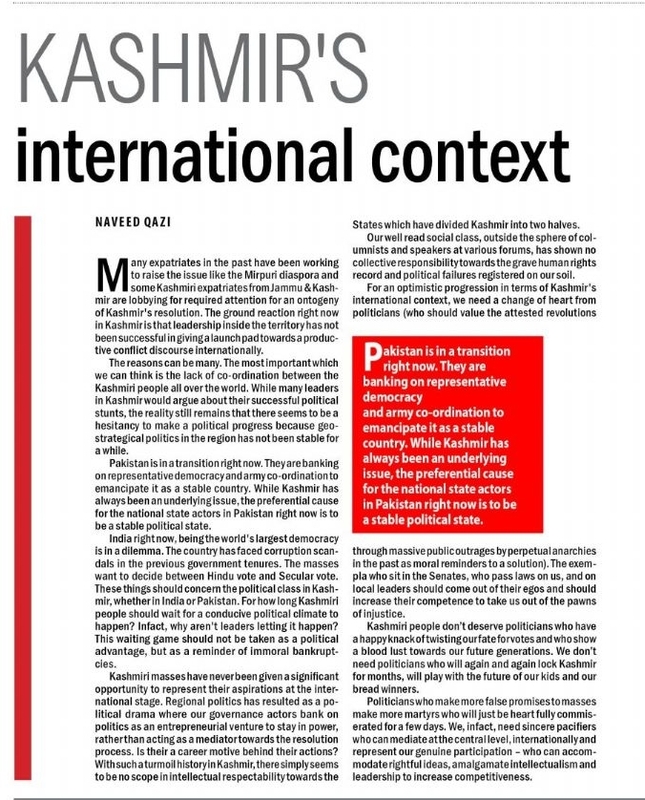 For an optimistic progression in terms of Kashmir's International Context, we need a change of heart from politicians (who should value the attested revolutions through massive public outrages by perpetual anarchies in the past as moral reminders for a solution). The exempla who sit in Senates, who pass laws on us, should come out of their egos and should increase the competence to take us out of the pawns of injustice. Kashmiri people dont deserve politicians who have a happy knack of twisting our fate for votes and who show a blood lust for our future generations. Politicians who make false promises to masses make more martyrs who will just be heart fully commiserated for few days. We, infact, need sincere pacifiers, who can mediate at the central level, internationally and can represent our genuine participation - who can accommodate rightful ideas, amalgamate intellectualism and leadership to increase competitiveness.